Above: Heavy surf pounds the north shore of Oahu, Hawaii, on November 19, 2013. A major storm will produce waves that could reach 60 feet in the offshore waters north of Hawaii this weekend, with the potential for major flooding along north- and west-facing shores. Image credit: Laura Beauregard, U.S. Fish and Wildlife Service, via Wikimedia Commons. The low headed for Hawaii is now pushing south from the Aleutian Islands of Alaska. It’s the southward extension of an intense upper-level storm system barreling across the Gulf of Alaska. The unusual southward trek of this low is part of a massive jostling for position among weather features across the North Pacific. 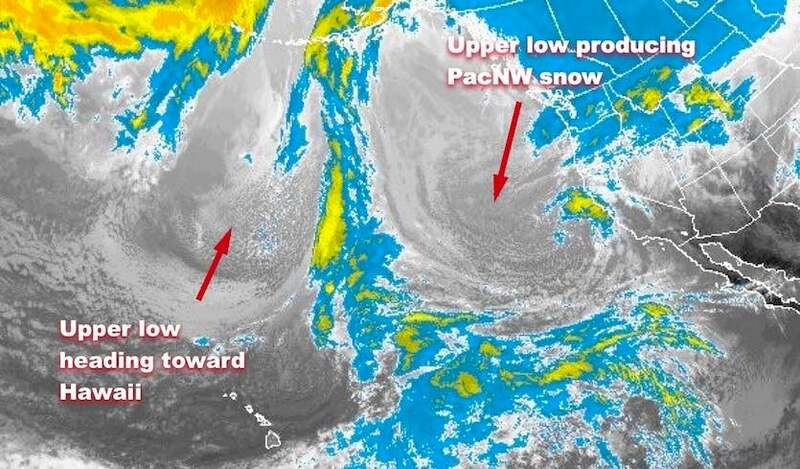 Another facet of this large-scale realignment will be an unusually intense and prolonged spell of winter weather in the Pacific Northwest, including multiple snow threats for the Seattle and Portland areas from this weekend into next week (see the weather.com writeup for more details). Figure 1. Infrared satellite image from 1830Z (10:30 am PST) Friday, February 8, 2019, showing two strong upper lows in the North Pacific that will have major effects on the weather in Hawaii and the Pacific Northwest. Image credit: NOAA/NESDIS. As the upper low approaches Hawaii from the north on Friday and Saturday, a surface low just north of the islands will rotate around the upper low while intensifying, finally swinging back south on Saturday night. The surface low is predicted to move within about 200 miles of Oahu by Sunday night before it slowly lifts north on Monday. The low may continue to bring unsettled weather to the islands through much of next week, though the worst is expected to hit this weekend. Figure 2. Forecast from the GFS model, issued 12Z Friday, of the unusually strong 500-millibar upper low and surface low north of Hawaii at 12Z (2 am HST) Sunday, February 10, 2019. Image credit: tropicaltidbits.com. 1)Significant #snow in #Seattle & #Portland this weekend. 2)Powerful #Kona low may bring gale force winds to #Hawaii. In some ways, the Hawaii storm is an especially potent example of a kona low, the biggest weather-maker in Hawaii’s winter climate. (Kona is the Polynesian term for "leeward," as noted in the AMS Glossary.) Kona storms typically approach the islands from the northwest or west, bringing in moisture-laden south to southwest winds, the opposite of the typical trade winds. Kona storms typically soak most of the islands, including those areas to the west and southwest (leeward) of the volcanic peaks that are usually dry when the normal trade winds blow. "This is the strongest forecast kona low that I have witnessed near Hawaii in my 25-plus years living on Oahu," said Dr. Steven Businger, an expert on kona storms and chair of the Department of Atmospheric Sciences at the University of Hawaiʻi at Mānoa, in an email. 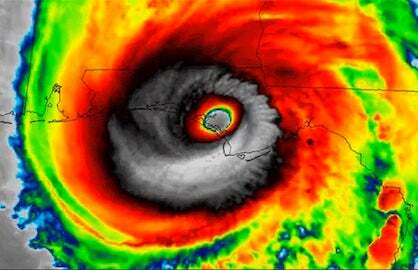 He noted the rapid intensification predicted for this weekend as an unusual feature. Figure 3. 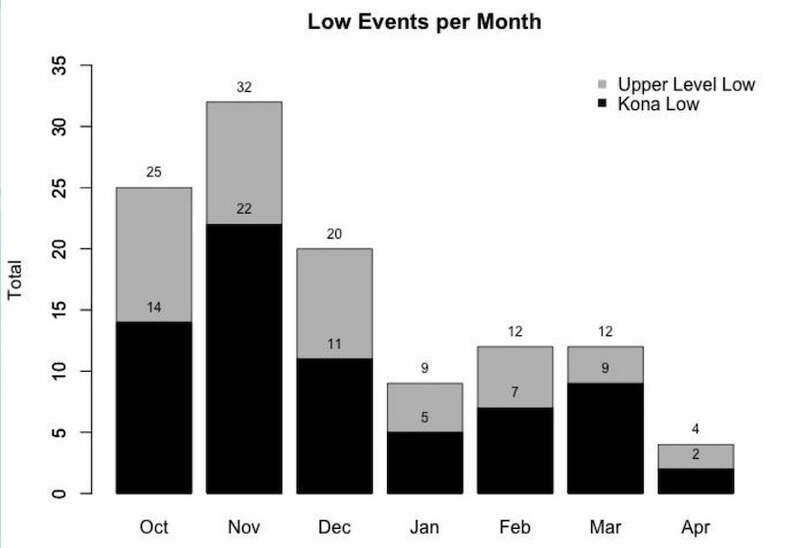 Frequency of kona lows by month during the period 1981 - 2014. This 34-year span saw 70 kona lows, with a primary peak in November and a secondary peak in March. Image credit: Steven Businger, University of Hawaiʻi at Mānoa. The most impactful part of this weekend’s Hawaii low may be the massive amounts of water that will be pushed toward Hawaii’s north- and west-facing shores. A separate storm well to the northwest will push long-period swells into the same region, adding to the problems. 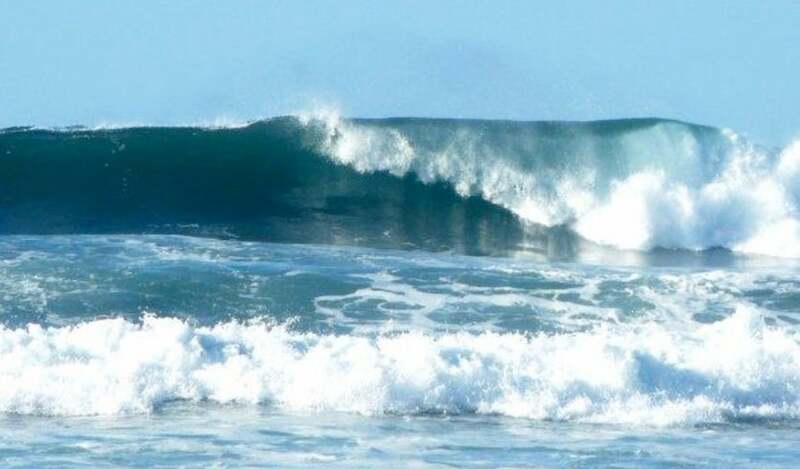 “Extraordinary large and disorganized surf will produce life- threatening conditions in the surf zone along north and west facing shores from this weekend into early next week,” warned the NWS in its surf zone forecast on Friday morning. Open ocean wave heights could exceed 60 feet off the north and west coasts, with wave periods as high as every 15 seconds, according to the most recent outlooks issued by NWS/Honolulu. “Those are very scary numbers for ships,” said Businger. "Fifteen seconds is a very short period for a 60-foot open ocean wave, meaning that these waves will be very steep and an extra hazard for shipping." The steep waves may also result in shoaling, which could accentuate the near-shore wave heights. Although the most intense surf will gradually abate after Sunday, unusually high waves can be expected well into next week as the kona low lingers northeast of Hawaii. High winds are another serious threat from this weekend’s Hawaii low. 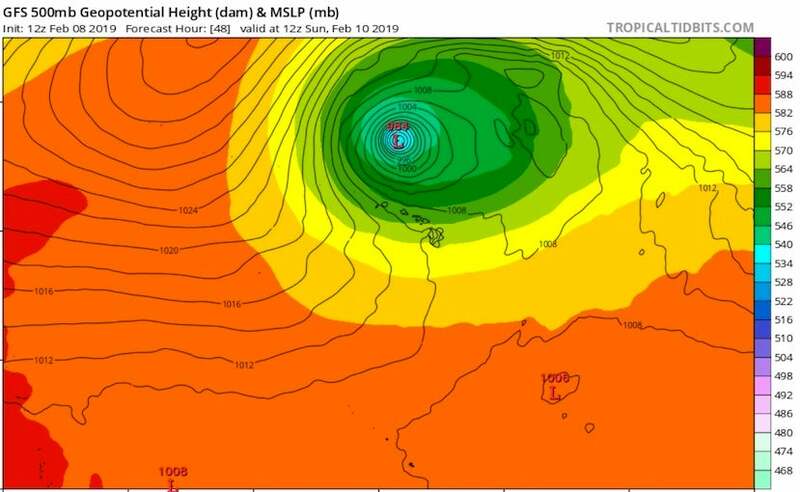 One surge of strong wind is expected Friday night, with a more intense round on Saturday night into Sunday as the surface low intensifies and draws closer. High wind warnings may be issued for most or all of Hawaii for late Saturday night and Sunday. “Given the unusual northwest thru west wind direction during the expected peak of the wind event, downed trees and power outages will be a distinct possibility statewide, with the areas where the winds get funneled most effectively in these wind directions being the most susceptible,” said the NWS on Friday morning. The unusual wind trajectory may result in downslope effects that exacerbate winds on the south sides of islands, including the Honolulu area. “One rough analog to this is the downslope windstorms that occur along the Front Range of the Rockies from Montana to Wyoming and Colorado,” noted weather.com’s Jon Erdman. 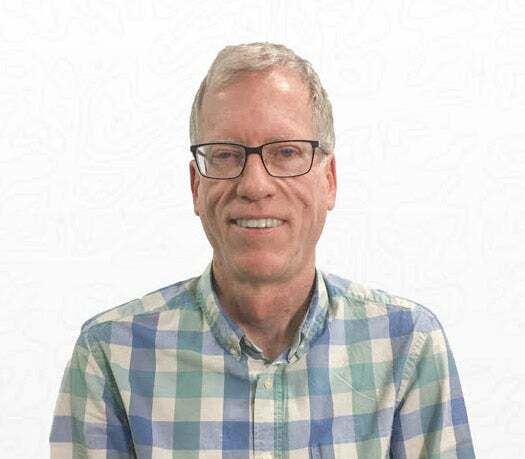 According to Businger, "There is the potential for some downslope wind storm damage in the Honolulu neighborhoods on the south slopes of the Koolau Mts. of Oahu (my house could be one of these as it is located at 1000 feet, across from Diamond Head)." Sustained winds could hit 115 mph, with gusts as high as an amazing 145 mph, at the highest elevations of Mauna Loa and Mauna Kea on Hawaii’s Big Island, according to the NWS forecast issued Friday morning. Both summits are located above 13,500 feet; real-time summit data is available online from the Mauna Kea Weather Center. Winds will be less intense but still quite strong at the scientific facilities located atop Mauna Loa at elevations closer to 11,000 feet. “Typically, our high winds are more in the 40ish range, where the Mauna Kea summit often sees 80+mph winds and will record gusts 100+,” said Ben Berkey, an observer at the Mauna Loa Solar Observatory operated by the National Center for Atmospheric Research. Nearby at NOAA’s Mauna Loa Observatory, where carbon dioxide measurements have been collected for more than 60 years, the highest one-hour average wind on record is 24.8 meters per second (55.5 mph), observed on December 25, 2014, according to station chief Darryl Kuniyuki. Current weather conditions at the Mauna Loa Observatory can be accessed at the facility’s website. Figure 4. 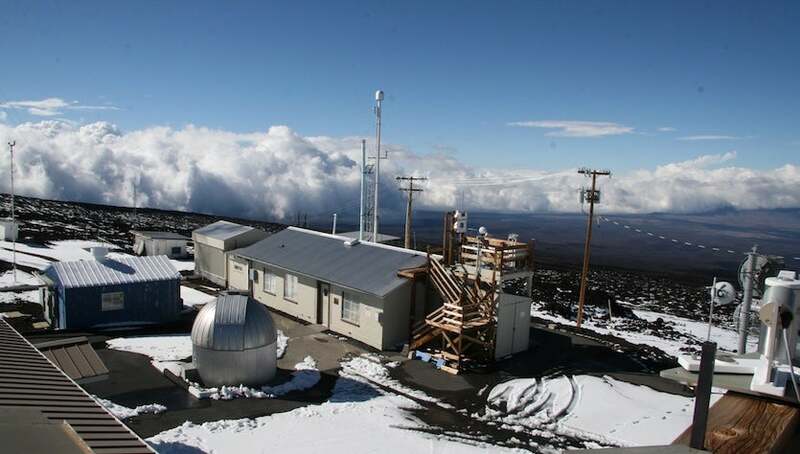 NOAA's Mauna Loa Observatory after a snowstorm. Image credit: Mary Miller, Exploratorium, via NOAA Earth System Research Laboratory. Kona lows can result in severe weather over Hawaii, typically east of the low center. In this case, the prime area will remain north and east of Hawaii, reducing the threat for severe storms. Businger noted that an intense kona low on March 9, 2012, produced tornadoes and 4.25” hail (larger than softball size), and a bow echo led to wind gusts of 95 mph in Lihue on November 4, 1999. Water temperatures in the Hawaiian Islands range between 75 - 78°F (24 - 26°C), which is close to average for February. These waters are marginally warm enough to support the transition of the low into a subtropical storm, something phase space diagrams for the GFS and UKMET models from Florida State University have supported for several days. However, the Central Pacific Hurricane Center has not yet mentioned the system in their Tropical Weather Outlook. The first name on the 2019 list of storms for the Central Pacific is Akoni. In the unlikely event that Akoni does manage to form, its formation location would be unprecedented in the historical record. According to statistics compiled by NOAA, since the satellite era began in the 1970s, only two named storms have formed in the Central Pacific in January or February: Category 3 Hurricane Ekeka of 1992 and Category 2 Hurricane Pali of 2016. Both hurricanes formed in warm waters near the equator at a latitude near 5°N, over 1000 miles southwest of Hawaii. 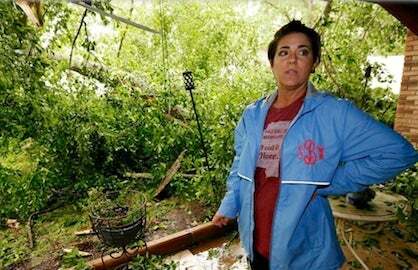 See the weather.com article by Jon Erdman for more on the variety of impacts in Hawaii posed by this weekend’s storm. 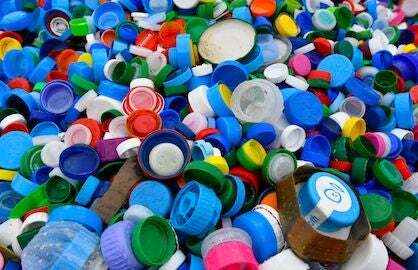 Dr. Jeff Masters contributed the Akoni section of this post.